The 100-calorie pack is marketing gold and, if used correctly, can be a great way to waylay the damage from snack attacks. I have no problem paying a bit more for someone to measure my calories and vacuum pack them into colorful, shiny, and come-eat-me-and-don’t-feel-guilty packaging. However, 100-calorie packs can only help so much with discipline, so I feel the packaging is missing something… WARNING LABELS! And I don’t mean the warning you often see after the ingredients (“product contains wheat, eggs, dairy, and is manufactured in a facility that processes nuts.”) I think they need to stamp the following warning, “Distractions and stress may lead to overconsumption of 100 calorie snack packs leading to ‘the 400 Calorie Meal. '” This warning may help those of us not quite satisfied with our meager, measured portions as we’re surfing the web, watching Oprah, or on deadline. Let me know if this sounds familiar. I go to the grocery store’s “100-calorie pre-packaged section” (which is offering more and more choices every month) and decide to stock up–100 calorie almond packs, Oreo Crisps, Nutter Butters. 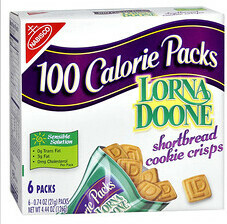 Sometimes my pantry looks like the 100-calorie pack aisle, just so I can have a wide variety on hand if I NEED THEM. Problem is, when I’m stressed and not aware, I go back and forth to the pantry three or four time… in one sitting (all the while tricking myself into thinking I’m being healthy because of the 100-calorie title). Pre-portioned snacks are not going to be friendly, weight-loss solutions unless we practice awareness while eating them. If you are a 100-calorie portion controller, use your Count Me Healthy to monitor the amount of 100-calorie packs and/or snacks you consume a day. I know it’s better to cut down on processed food altogether, so I’m making a more conscious effort to eat whole foods. However, if I eat one of the packs, I move a bead over and move on. The bracelet serves as an excellent awareness tool. Have you used Count Me Healthy to better your life? Let us know by entering the Healthy Her contest (click here to enter). We’ll highlight a new Healthy Her on our blog, Facebook, and Twitter, complete with pictures and details about the winner’s health & lifestyle goals. Plus, we’ll give the winner a Sassy Stack so she can continue to keep multiple wellness goals top-of-mind.